Montcross Area Chamber member BNI – Belmont Business Builders is helping host a major event designed to help business people maximize the benefits of networking. 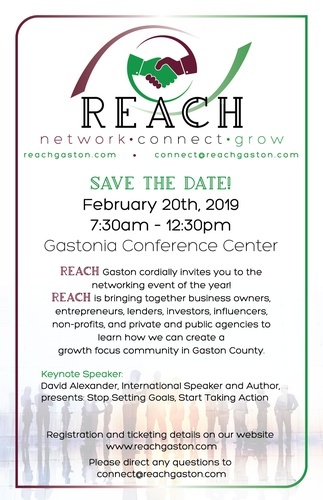 Five networking specialists will be presenting in large group and breakout sessions on Wednesday, Feb. 20, 2019, at the Gastonia Conference Center from 7:30 a.m. until 12:30 p.m. Breakfast and lunch are included. The cost to attend is $50, and early bird registrants save 20 percent. Table sponsorships also are available. More details at www.reachgaston.com. The event is open to the business community, members of other networking organizations, students, press representatives and interested parties from all levels of government and business. The cost to attend is $50, and early bird registrants save 20 percent. Table sponsorships also are available. More details and register at www.reachgaston.com.